Norway's leading jazz and fusion band in the 80s, now available on CD. 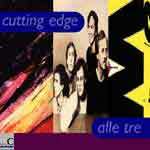 Cutting Edge's three vinyl albums recorded between 1982 and 1986 in one double CD release. With Norwegian booklet only.